Leader of the right-wing Israeli Jewish Home Party Naftali Bennett called for the “free world” to recognise the Israeli occupation of the Golan Heights, Arab48.com reported yesterday. While addressing a security conference at Herzliya, near Tel-Aviv, Bennett called for intensifying Jewish settlement to reach 100,000 Jews in the area within five years. “I call on the international community… to recognise Israel’s sovereignty over the Golan,” he said. 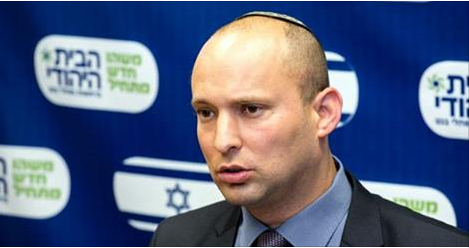 Bennett, who is the Israeli education minister, asked who Israel should handover the Golan Heights to. “Who would you like us to give the Golan Heights to? To [Syrian President Bashar] Assad? To [Al-Qaeda affiliate] Al-Nusra Front? To the Islamic State group? To [Lebanon’s] Hezbollah?” AFP reported him saying. Israel occupied the Golan Heights from Syria in 1981 and began building settlements there. Recently, it started to search for oil in the area.